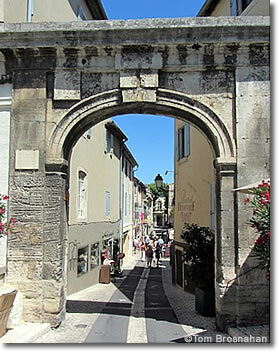 The tidy, prosperous town of St-Rémy-de-Provence, 20 km (12.5 miles) south of Avignon on the norhern edge of Les Alpilles, is a pleasure to visit, which may be why tourism is now its major source of income. Fontaine ancienne, with a bust of Nostradamus. Combine your visit with a tour of the Roman ruins of ancient Glanum, now called the Plateau des Antiques, on the southern outskirts of St-Rémy. After wandering St-Rémy's narrow, winding streets glancing at the many shops offering handicrafts, local food products, antiques and objets d'art, find a congenial café-bistrot on the sycamore-shaded avenue Mirabeau or in one of the quiet squares for lunch. The historic Hôtel Mistral de Mondragon is now the Musée des Alpilles with exhibits and artifacts from the region and the area covered by the Parc Naturel Régional des Alpilles. 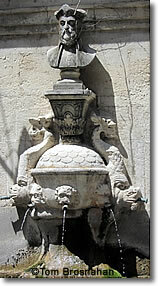 On a corner in the old streets you may spot a curious fountain topped by a bust of Nostradamus (1503-1566). The famous apothecary and seer was born in St-Rémy, and his family's house on a nearby street can still be seen. His famous book, The Prophecies, was first published in 1555 and has been in print ever since. Nostradamus lived the latter part of his life in Salon-en-Provence, about 40 kilometers southeast of St-Rémy. The Maison de Nostradamus in Salon is a museum dedicated to his life. It also appears that the people of St-Rémy, a popular tourist destination, have a sense of humor, as shown in this sign on the side of a building. 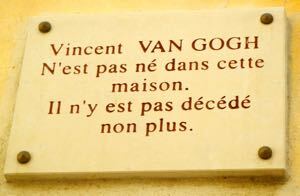 "Vincent Van Gogh was not born in this house. He didn't die here either."